At Superior Healthcare, we don’t believe in guesswork. And we won’t recommend any treatment without having conducted the proper tests. We know your time is valuable and hearing that what you had planned to be a short appointment has turned into an entire day of running around for tests, is not something anyone wants to deal with. We do allergy testing, x-rays, computerized range of motion and muscle testing, full blood work up, and diagnostic vascular ultrasounds right here in the Superior Healthcare office. Allergy testing may include traditional prick tests as well as advanced ALCAT testing which identifies sensitivities and allergies for more than 350 different agents from foods to molds and other chemicals. Our computerized range of motion system accurately measures your spinal range of motion. 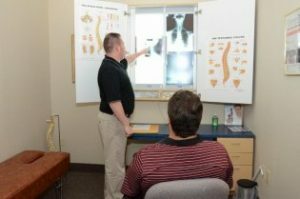 The level of detail these tests provide enables us to better understand the extent of spinal motion impairment, and to provide a more detailed treatment plan. Computerized muscle testing enables us to track muscle strength losses due to injury and illness and to track improvements over time so we can precisely gauge progress and make sure that your treatment plan is progressing as expected. Our diagnostic vascular ultrasound enables us to quickly assess any vascular issues including blockages that may be the cause of your symptoms. It quickly eliminates potentially life-threatening vascular issues so that we can quickly move on to finding the source of your symptoms. When used together, each of our diagnostic strategies provides us with a holistic view of your health and the underlying causes of your symptoms. Thanks to our cutting-edge diagnostic services, our patients aren’t subjected to the kind of frustrating guess work they may be subject to by other healthcare providers. Visit Superior Healthcare for a consultation and discover the difference that our physical medicine approach makes to your wellbeing.